Taking Handy to New Heights! The Ladder Companion is the first side mounting tray/shelf, and only product of its kind, that works with extension ladders. Its revolutionary design is ideal for construction professionals and home owners alike. Unlike typical ladder trays that hang over the ladder rungs, The Ladder Companion shelf/tray slides into the rungs from either side, providing secure and easy access to your tools, paint supplies and more. This allows the user to climb up and down the ladder without having to remove the tray. The ladder tray is a great addition to your ladder accessories! 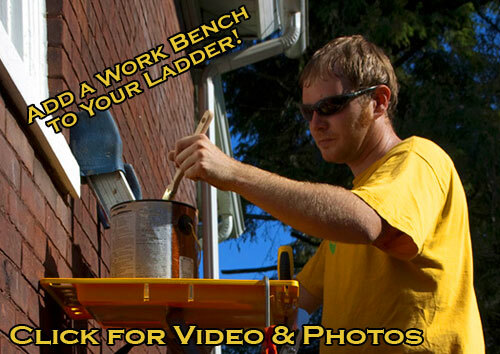 Saves you time - reduces your trips up and down the ladder to get tools to finish your projects around the house or on the worksite. Makes your projects easier  all of your project tools and supplies are handy, right where you need them at all times. No need to juggle multiple tools in your hands when trying to complete your projects. Makes project safer  less dropping of tools and supplies, because they are handy and available on the Ladder Companion. Also less trips up and down the ladder means less chances of hurting yourself while working on a project! And because the The Ladder Companion™ is fully adjustable, it keeps your tools level no matter what the angle of your ladder.